Afghanistan is the world’s largest supplier of opium, generating up to $6.6 billion annually according to a recent United Nations estimate which exceeds the amount contributed to Afghanistan’s Gross Domestic Product by licit agricultural crops. Over 90% of this activity occurs in Taliban controlled or contested areas. Insurgent and criminal groups generate significant revenue in various ways from this source of funds. This is assessed to be the Taliban’s largest revenue source. The groups not involved directly in producing narcotics, enrich themselves by taxing the crops and the illicit product, extorting protection fees, and tolling transportation as the product is moved and exported to addicts and drug cartels worldwide. The world's number one opium-producing country, Afghanistan, braced for an exploding poppy harvest in 2017, as farmers were cultivating the illicit crop in areas where it has never grown before. Taliban fighting Afghan government troops in rural areas of the country, fueled the poppy trade by engaging in trafficking and skimming hundreds of millions dollars in profit to fuel their militancy. Taliban insurgents, according to U.S. officials, net 60 percent of their war chest from narcotics. Despite multi-billion-dollar international efforts to reduce narcotics production in Afghanistan, the total area of Afghan land under opium-poppy cultivation increased by 63% during the 2017 growing season from the previous year, and raw opium production increased by an estimated 88%. The early-warning system for famine for Afghanistan noted that low seasonal precipitation might hamper rain-fed and irrigated crop production in 2018. In the past, severe nationwide drought has coincided with significant decreases in opium-poppy cultivation. This was the case for the 1999–2001 drought and again for the 2008 drought. From 2002 to 2017, the US had spent more than $8.5 billion on counternarcotics in Afghanistan — about $1.5 million a day. In addition to war, opium fueled corruption and organized crime in Afghanistan, a country already ranked among the five most corrupt states in the world by Transparency International. The United Nations Office on Drugs and Crime reported that opium poppy cultivation in Afghanistan rose to a record high in 2013, possibly spurred on by farmers seeking to insure their incomes against uncertain conditions after the NATO troop pullout concludes in 2014. 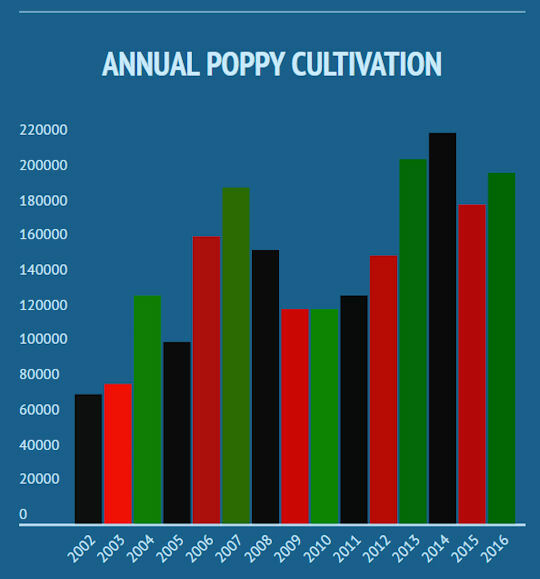 In the report, released on November 13, 2013, the U.N. agency said the area of Afghanistan being cultivated for poppy production has risen to 209,000 hectares, higher than the previous peak of 193,000, reached in 2007. It said this year's poppy harvest resulted in 5,500 metric tons of opium, a yield nearly 50 percent higher than last year. It also said farmers may be guarding against an uncertain future by increasing production of opium now. From 2010 to 2011 the amount of opium produced in Afghanistan increased from 3.6 million kg to 5.8 million kg, according to the UN Office on Drugs and Crime (UNODC). Its December 2011 Opium Survey noted that the total area under opium cultivation had risen from 123,000 hectares in 2010 to 131,000 hectares in 2011. Corruption and illegal drugs in Afghanistan threaten to undermine all aspects of the country's efforts to build a sustainable economic infrastructure and functioning democracy. Drug-related corruption in Afghanistan - one of the most intransigent problems in the country - must be confronted, particularly at provincial and district government levels. For more than two hundred years, the international geopolitical situation has worked against the consolidation of an effective central government in Kabul because it has exacerbated Afghanistan's endemic problems of regional warlordism and particularistic nationalism. Over the past quarter century, the opium economy grew because of the failure of the state. The illicit opium trade is the one economic activity that not only survived, but flourished, during and after the war. Now it accounts for more than half of GDP and is said to involve corrupt government officials at every level. Tribal warlords control the poppy-growing areas, using the proceeds to fund their militias and arms purchases. Through the poppy/opium value chain, warlords control access to land and credit for much of the rural landless. Poor sharecroppers must agree to grow poppy to get access to the land and credit they desperately need to support their families; they use part of the land to grow other crops for their own use. Ahmed Wali Karzai, President Hamid Karzai's younger brother, was the chief of the Kandahar Provincial Council, the governing body for the region that includes Afghanistan's second largest city. Ahmed Wali Karzai was influential among the Popalzai, a Pashtun clan, in Karzai's home province of Kandahar. Opposition leaders in Kandahar said that Ahmed Wali Karzai was the biggest warlord of them all. By 2004 US officials suspected Ahmed Wali Karzai of involvement in narcotics trafficking. In 2005 a senior diplomat told the Herald: "The Karzais don't own enough land or oil wells to be dishing out the Thurayas [mobile phones], money and wheat bags that Wali is said to be handing out to seduce would-be voters in Kandahar." Allegations that Ahmed Wali Karzai profited from narcotics trafficking circulated widely in Afghanistan. Both men said the accusations of drug trafficking are politically motivated. Assertions about the involvement of the president's brother in various incidents were never investigated. The Bush White House said it believed that Ahmed Wali Karzai was involved in drug trafficking, and American officials warned President Karzai that his brother was a liability. Afghanistan's opium production increased more than 15-fold since 1979, the year of the Soviet intervention in the country. By 2000 Afghanistan was the source of 70% of all of the illicit opium produced in the world. Following a decline in 2001, production resumed at high levels in 2002, again making Afghanistan the world's largest producer (followed by Myanmar and Laos), accounting for almost three-quarters of global opium production. Traditionally, the bulk of opium poppy cultivation was in the south (Helmand province, 52% of total cultivation in 2000) and the east (Nangarhar, 24%). In 2001 the Taliban ban pushed the output to the north (Badakshan, 83%, though of a far lower total). In 2002 the largest areas under cultivation were again Helmand (40%), Nangarhar (27%) and Badakshan (11%), followed by Uruzgan (7%), Kandahar (5%) and Ghor (3%). Thus, 93% of the area under poppy cultivation is restricted to six provinces that have not yet complied with the ban issued by the Government in January 2002. The area under poppy cultivation is a tiny fraction of the arable land in Afghanistan (0.9% in 2002). Even in the poppy growing villages, only 8% of the arable land was used for opium cultivation in 2000, though in Helmand and Nangarhar the rates were significantly higher (about one-third of the arable land). The bulk of poppy cultivation took place on irrigated land in the south, where productivity can be 3-4 times higher than in the rain-fed provinces of the north. Most ethnic groups are involved in opium production, though there seems to be a concentration among Pashtun and Tajik villages located in the main opium producing regions of southern, eastern and northern Afghanistan. Opium cultivation spread throughout the country in the 1990s, following the ethnic distribution of itinerant workers who disseminated the know-how for opium production. Trafficking then spread to neighbouring countries, facilitated by ethnic links across borders: Pashtuns in Pakistan; Baluchis in Pakistan and Iran; Tajiks in Tajikistan; Uzbeks in Uzbekistan; and Turkmens in Turkmenistan. Under the leadership of President Karzai, by mid-2008 the Government of Afghanistan had made some progress in combating narcotics. However, drug trafficking remains a serious threat to the future of Afghanistan, contributing to widespread public corruption, damaging legitimate economic growth, and fueling violence and insurgency. A successful counternarcotics strategy in Afghanistan hinges on maintaining security, building public capacity, attaining local support, and actively pursuing our joint counternarcotics strategy. Poppy cultivation in 2008 continued to be marked by the divide between the increasingly poppy-free northern provinces and the insurgency-dominated regions in the south. Through political will, and by using a mixture of incentives and disincentives, governors in key northern provinces like Badakshan and Nangarhar significantly reduced poppy cultivation. Inspired by the Nangarhar model, the newly appointed governor of the southern province of Helmand took steps to implement the first truly serious counternarcotics campaign in the province. Drug control efforts in this area of pronounced poppy cultivation are thwarted by heavily entrenched Taliban centers of power. In 2007 Helmand Province cultivated more than half of Afghanistan's illegal poppy crop. Difficult security conditions greatly impede counternarcotics operations, particularly in the south and southwest provinces, areas in which the insurgency and organized crime groups predominate and where over 85 percent of Afghan poppy is cultivated. Gilles Dorronsoro, Visiting Scholar, Carnegie Endowment for International Peace, argues that "We do not have the resources to fight drug production. The social and political costs would be too high. Opium crop eradication in Afghanistan has never worked except when the Taliban have undertaken it, and even then, while production was stopped in 2000, trafficking continued, generating important revenues for the Taliban and traffickers. The reason for this relative success is that the Taliban had reasonable control over the rural areas and were sufficiently organized, permitting them to carry out a policy that ended up proving very costly for them. For instance, tribes with economic interests in drugs betrayed the Taliban in 2001 to join U.S. forces and immediately planted opium poppies, even before the end of the fighting. Local programs can only change the organization of the production, not eradicate it. Second, the drug economy is probably the most important source of personal income in Afghanistan today (in cash at least). Farmers are dependent on the revenues. Government officials at the highest level and the Taliban alike benefit as well. Other than fighting on a small scale against trafficking and laboratories, it would be politically difficult to eradicate or even seriously limit drug production in Afghanistan."